I cannot remember the last time I shared an update with you on how Willow is or in fact how big she is; she's a giant. I think last time was around 26 weeks old possible which feels like forever ago; at least half of her life so far. 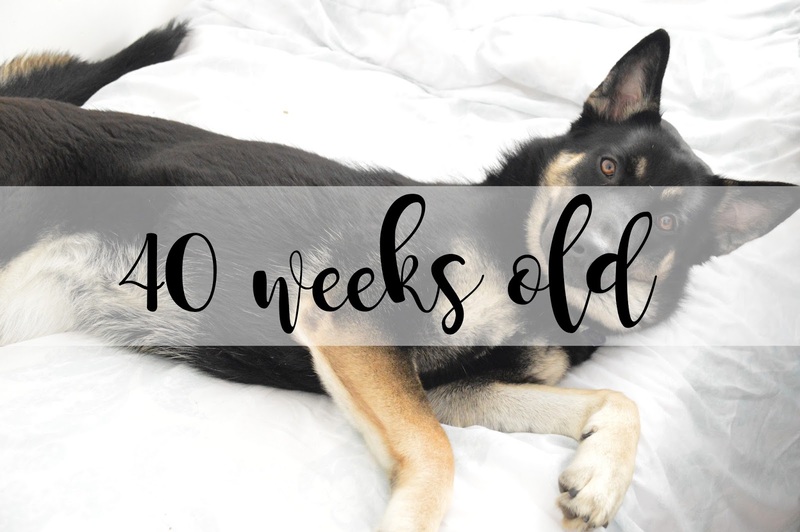 So Willow turned 40 weeks old yesterday which is pretty much just over nine months old. (She was nine months on the 14th September). It definitely doesn't feel like that we've had her for pretty much seven months but I wouldn't change that for the world; it's been an incredible journey having her in our lives. So Willow is probably weighing at least 30kg by now; the last time we had her weighed was around 29 weeks when she still weighed 26kg which she weighed when she was 26 weeks old. She's older, she's gone through a growing stage, it wouldn't surprise me if she's near the 30 mark! Willow has gone through her first season which is something every dog owner dreads especially if there is a male dog in the house too; she was just eight months when she came into season. I have to say it didn't effect her whatsoever, however she did have a lot less walks compared to usual because we didn't want to have the issues of dogs on the street wanting to try and get to her. Willow has finally found her voice in the past few weeks; she is now definitely a Husky. On a daily basis she enjoys coming into my bedroom after doing her business first thing and tends to speak to me and wake my mum up too. After she has woken my mum up from speaking to me, she'll then go and lay on my mum's bed and spend a good ten minutes howling, talking and trying to say "I love you". It's one of the best things about having her crossed with a husky; I love it! We've found out the best way to have willow walking is to carry a snack bag of chopped up carrots with us; she's absolutely obsessed and more worried about stuffing her face with carrot than pulling to go and smell a bush or a lamp post. We've definitely figured her weaknesses out and carrot is one of them; along with everything else that goes onto our plates! Let me know if you have any questions about owning a Gerberian Shepsky!